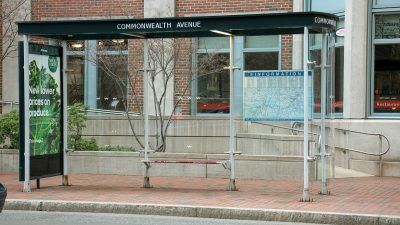 The MBTA is looking to strengthen its bus service and boost ridership by adding more shelters and adding benches throughout the greater Boston area. Officials from the agency presented a preliminary proposal to T’s Fiscal and Management Control Board on Monday. They plan to double the number of bus shelters and benches, add real-time arrival displays to 90 percent of journeys and establish “clear and enforceable roles” for maintaining these amenities, according to the presentation. The T plans to begin construction during the 2020 fiscal year and hopes to finish this network buildout within three years, the presentation states. Additionally, Rowe said research from the University of Utah showed that “enhanced and improved bus stops” grow ridership by enticing new riders to try the bus, while research from the University of Arizona proved that waits at stops without amenities felt more than 1.3 times longer to riders than they actually were. Rowe said many MBTA bus stops were in bad condition and needed maintenance and improvement to better serve passengers. Currently, the T has around 640 bus shelters, according to the presentation, which constitutes less than 10 percent of the total number of 7,810 stops. The T controls around 340 of these shelters — it owns and maintains around 170 total bus stops independently with the other 170 jointly owned and entirely maintained by contractor JCDecaux, a company that specializes in outdoor advertising. Rowe said the T’s 15-year contract with JCDecaux is expiring in December, so the agency will be able to rethink its program and make significant improvements to the network’s bus stops. Stephanie Pollack, secretary and CEO of the Massachusetts Department of Transportation, said at the meeting the T needed to create a new and improved partnership with a private company and that she did not want potential advertising revenue to control where shelters were placed. However, T officials acknowledged at the meeting there were several potential challenges that they would have to overcome to accomplish this plan. Rowe said the T would have to work with local municipalities to pay for the operating expenses of each shelter, as the agency currently estimates it will cost around $70,000 to maintain a shelter for 10 years. This exceeds the estimated installation cost of $40,000. Marta Trzcinska, 24, of Brighton, takes the 57 bus home and said she thinks the proposal is a good idea, as the T could install more shelters to help mitigate overcrowding of bus stations during rush hour times. Brighton resident Alex Powell, 40, said he takes the 57 bus home and thinks installing real-time arrival displays and bus shelters would better serve the T’s customers and increase ridership. Michael Durant, 26, of Brookline, takes the 60 bus home and said while he did not think bus shelters were as much of a problem, he did support the greater use of real-time arrival displays. You’ve illustrated the story with a photo of the most useless bus shelter in the city. Nobody is going to wait for a bus here because it is the penultimate stop on the 57 bus. 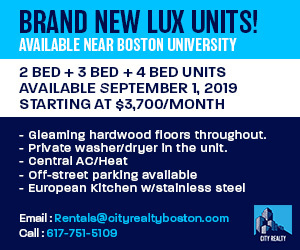 You’re always better off walking the last 100 yards to Kenmore Square.